About 2 months ago, my brother gave me a Pikachu plastic model assembly kit. Well I finally assembled it today. This is my first time putting together parts to form a plastic model. It was fairly easy and pretty fun. I took about 20 minutes constructing it, but it could be done in a much shorter time frame. I filmed the assembling process, check it out below! Location: Universiti Sains Malaysia, Engineering Campus. 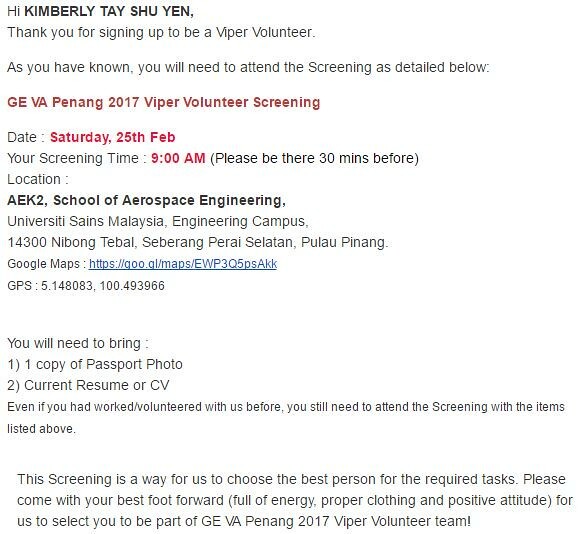 End of last year, WC messaged the people from Viper Challenge regarding volunteering for Great Eastern Viper Arena – Penang. This event is on a weekend and located at Batu Kawan Stadium, which is about a half an hour drive away from my campus. Joining the event as a participant is expensive, but you get paid for volunteering! Since WC was the first person to contact the people at Viper Challenge about volunteering, they asked if he could gather people from our campus that are interested to volunteer for this event. The response was pretty amazing, with 235 respondents in less than a week. During the registration, there were some ignoramuses visible. For example this lady. 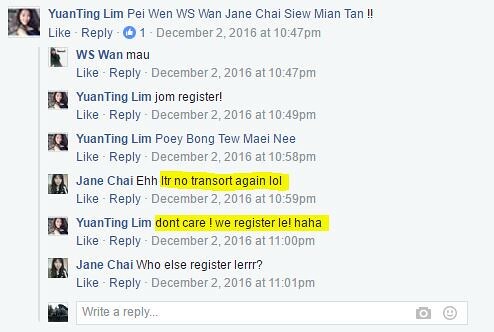 Ms YuanTing Lim tagged her friends in the registration post, and one of her friend Ms Jane Chai asked what if they don’t have transport again. This means that they were in a situation before where they registered for something and ended up with no transport to attend an event. But Ms know-it-all (YuanTing Lim) was like don’t care. I think that this shows how irresponsible and ignorant these people are. They do not think ahead of themselves, but just think of the present. About a week ago, Viper Challenge emailed those who registered to volunteer for a screening session. Many who registered voiced out that they did not receive any email. 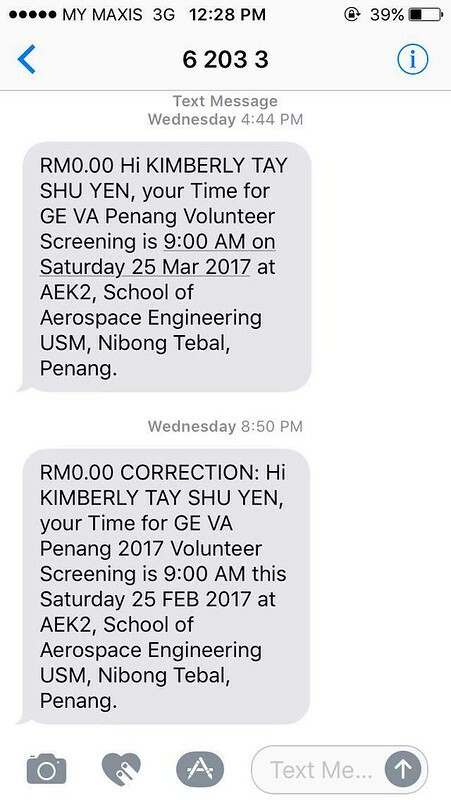 So, Viper Challenge being a responsible organiser blasted out a text message reminder of the screening session. They even blasted out a second text message when there was a mistake in the first one. WC even posted a reminder on our campus FB group. So those 200+ people who registered should be well informed about this screening right? Yesterday was the screening day, 4 staffs from Viper Challenge drove all the way from Kuala Lumpur early in the morning to reach our campus in time to start the screening at 9 am. Guess what, they were here from 9 am to about 2.30 pm, and only 50+ people showed up for the screening. That’s not even 25% attendance rate. And the Viper Challenge staff said that only 15 person RSVP-ed for the screening. I mean come on, if it’s so easy to fill up a Google form, why can’t they inform the people if they can’t turn up? I’m sure plenty of them registered for the sake of registering, but never bothered to commit themselves to it. They probably think that this is some kind of university level event that you can go or don’t go to your liking. But it’s not. This is an actual international event that people invest in time and money into it, and what do they get in return? Snobbish, irresponsible and ignorant university students. Of course there is still that handful of responsible individuals that came for the screening. But I am so ashamed of the rest of those that did not turn up. The staffs at Viper Challenge now have a bad impression of students from Universiti Sains Malaysia, Engineering Campus. They are truly disappointed. Everyone should take responsibility to their actions. Best.